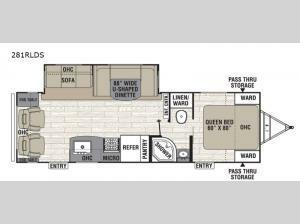 If you've been looking to upgrade your RV to a unit with space and comfort, then this travel trailer is the one for you! You'll find two entry doors; one leading into the rear living area and one that puts you directly in the front private bedroom. The large slide out in the living area provides more space to relax and the two lounge chairs makes that easy to do. This unit features a walk-through bath with a radius shower for more space and a linen/wardrobe for towels.The three burner range allows you to cook a meal just like you do at home and you'll appreciate a pantry in this model for all your snacks and paper goods!